Dr. Karen Gregory is a doctoral prepared Acute Care Clinical Nurse Specialist with a specialty in asthma, allergy, and pulmonary medicine. She is a Registered Respiratory Therapist and Certified Asthma Educator. Dr. Gregory is employed at the Oklahoma Allergy and Asthma, Oklahoma City, Oklahoma and is an Assistant Professor at Georgetown University, School of Nursing and Health Studies. Dr. Gregory is currently the 1st Vice President and past president of our Beta Delta Chapter-at-Large. She has served consecutively on the Beta Delta Chapter-at-Large Board of Directors since 2004. Sigma’s mission is to “support nurses’ efforts to improve the health of the world’s people.” Sigma has offered many opportunities to personally promote scholarship and leadership. Dr. Gregory has a passion for patients with pulmonary disease. Sigma has provided an evidence-based practice grant to pursue doctoral studies in the field of pulmonology, asthma and allergy. Sigma has helped developed leadership skills at national and international levels. Dr. Gregory is a Past-President of the Association of Asthma Educators. She serves in leadership roles for the American Academy of Allergy Asthma and Immunology and the American Association for Respiratory Care. She also holds active memberships and leadership positions in professional organizations serving on boards, committees, and projects. She lectures on issues related to pulmonary, allergy, asthma and disease management and is published in these areas. According to Dr. Gregory, Beta Delta Chapter-at-Large has been instrumental in mentoring novice and expert nurses. Sigma provides numerous opportunities for individual to promoted professional growth and development as members serve and mentor others. Welcome to Sigma Theta Tau, Beta Delta Chapter-at-Large! Whether you are a current member or someone that is considering membership, we welcome you. The opportunities to become involved, to grow and develop as leaders, and to contribute to the nursing profession are virtually endless. Sigma has supported me through scholarships and research grants from my undergraduate education through my doctoral training. 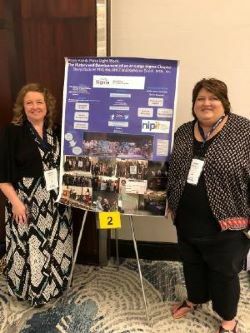 In addition, they supported me, along with the CDC, in the development of my immunization website, Nursing Initiative Promoting Immunization Training (www.NIP-IT.org), a website used by over 400 nursing schools across the United States. In addition, I have had the opportunity to meet and work with internationally known nursing scholars. In return, I have enjoyed being actively involved by serving on committees and being an officer within our organization. Each of you will experience membership in your own way. In fact, Sigma membership is an experience that is yours to design. I hope you will make use of the many opportunities that membership has to offer. Not only do you have the opportunity to be involved locally, but there are opportunities to participate in this global organization on a regional and international level as well. • to connect with fellow nurses and partners and work together to share our message, opportunities, and accomplishments. • to expand our collaborative work with other nurses and partners outside of nursing, so we can more successfully fulfill our mission. • to serve as a catalyst to bring about, initiate, produce fundamental change. Our final call is to use our skills as practical, innovative, and visionary nurse leaders to transform global nursing. Whether you are a member or non-member, come to our next meeting and get to know us. We look forward to meeting you! Congratulations to the winners of the Partners in Quality presentation and poster sessions! What is the Experience of Babywearing a NICU Graduate? The Leadership Succession Committee presents the 2019 Ballot. Each candidate has signed the Chapter Candidate Consent Form. The voting will close on April 19, 2019. I completed my BSN-Rn at University of Central Oklahoma, MSN in Nursing Education from Oklahoma Baptist University, and currently working on a DNP and will graduate in August 2019. I was inducted to the Beta Delta at-Large Chapter of STTI in 2012. I have served as a member of the board since 2013 in various roles (Awards and Recognition committee, AVP for UCO, and Social Media Chairperson). I am currently working as a Instructor at the University of Central Oklahoma and am the faculty chairperson for the UCO Student Nurses Association. Dr. Karen Gregory is a doctoral prepared Acute Care Clinical Nurse Specialist with a specialty in asthma, allergy, and pulmonary medicine. She is a Registered Respiratory Therapist and Certified Asthma Educator. Dr. Gregory is employed at the Oklahoma Allergy and Asthma, Oklahoma City, Oklahoma and is an Assistant Professor at Georgetown University, School of Nursing and Health Studies. Dr. Gregory is currently the 1st Vice President and past president of our Beta Delta Chapter-at-Large. 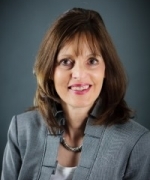 She has served consecutively on the Beta Delta Chapter-at-Large Board of Directors since 2004. Sigma’s mission is to “support nurses’ efforts to improve the health of the world’s people.” Sigma has offered many opportunities to personally promote scholarship and leadership. Dr. Gregory has a passion for patients with pulmonary disease. Sigma has provided an evidence-based practice grant to pursue doctoral studies in the field of pulmonology, asthma and allergy. Sigma has helped developed leadership skills at national and international levels. Dr. Gregory is a Past-President of the Association of Asthma Educators. She serves in leadership roles for the American Academy of Allergy Asthma and Immunology and the American Association for Respiratory Care. She also holds active memberships and leadership positions in professional organizations serving on boards, committees, and projects. She lectures on issues related to pulmonary, allergy, asthma and disease management and is published in these areas. According to Dr. Gregory, Beta Delta Chapter-at-Large has been instrumental in mentoring novice and expert nurses. Sigma provides numerous opportunities for individual to promoted professional growth and development as members serve and mentor others. I completed my RN-BSN, MSN in Education at Oklahoma Baptist University. I am in the last semester of my DNP at the University of Oklahoma Health Sciences Center with anticipated graduation in July of 2019. I was inducted to the Beta Delta Chapter at Large of STTI in 2015. I am currently working as an Assistant Professor at Oklahoma Baptist University College of Nursing and as a Quality Specialist for local home health agencies. I have served as the Vice President of the Masters/Doctoral Student Nurse Association at OUHSC and am a member of ONA. 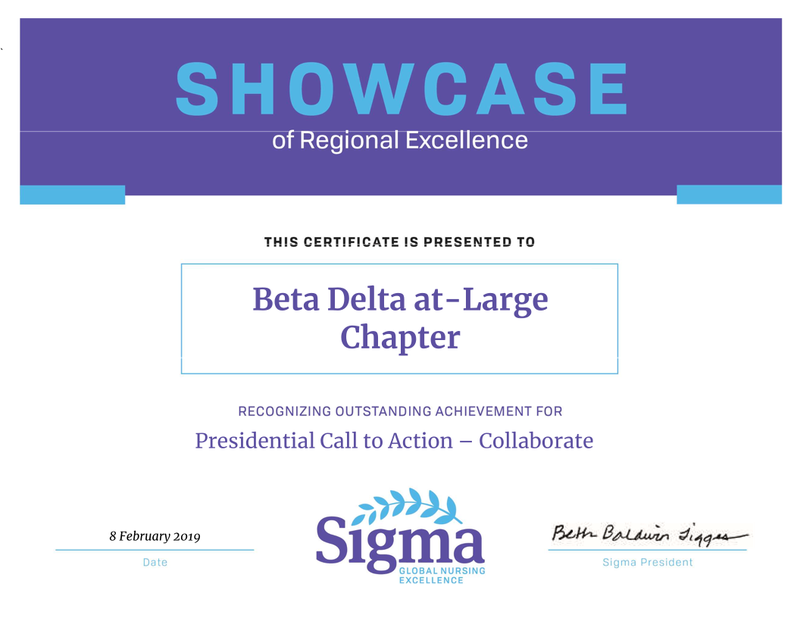 I have been a member of Sigma Theta Tau Beta-Delta At-large chapter since 2017. I obtained my MSN in Nursing Education from Kramer School of Nursing in May of 2017. I am currently in the doctoral program at Kramer. I have been employed at Kramer School of Nursing since 2017. I currently teach in the undergraduate program. My goal as AVP is to promote Sigma among the nursing community at OCU. I have been an Assistant Professor for the University of Oklahoma Health Sciences Center (OUHSC) College of Nursing at Duncan since summer 2007. I graduated from OUHSC in 1991 and later returned to earn my Masters of Science degree in Nursing Education in 2006. I have 26 years of clinical experience as an Oklahoma Registered Nurse in the fields of Pediatrics, Geriatrics, and Education. I have been a Sigma Theta tau International Honor Society-Beta Delta Chapter since 1990. I am a member of the Delta Chapter of Alpha Epsilon Lambda at OUHSC and Phi Kappa Phi Honor societies. I achieved certification as a Nurse Educator in Nov. 2007 from the National League for Nursing and strive to maintain certification at this national level. I am a member of the Oklahoma Nursing Association and Faculty advisor for the local Student Nurses Association. At the University level, I am the NCLEX Prep coordinator for the Lawton/Duncan site, AAC, ABSN and Traditional cohort selection committee since 2007, NCLEX Prep. Comm., and I have served as the Lawton/Duncan AVP for the past ten years. In 2012 I also received the Novice Faculty Excellence in Didactic Teaching National award. As chair of the Governance eligibility comm., I strive to coordinate the chapters AVP's activities, organize the induction ceremony activities, and help answer questions regarding eligibility and membership. Hello, I am Jill Baldwin. I am currently nursing faculty for OU College of Nursing at the Lawton campus. I received my BSN degree from OU and my MSN from University of Phoenix. I will graduate with my DNP in 2019 from American Sentinel University. I have been a member of Beta-Delta since 2006. I have served Beta-Delta in the Leadership Succession Committee and I hope to continue in this this position. Are you a member of STTI Beta Delta Chapter-at-Large but haven't been attending meetings? Now is your chance to meet other members and get involved in the activities of your chapter! For the calendar of events for 2018-2019 see the Upcoming Events section. Make plans now to attend! Are you on Facebook or Twitter? You can follow chapter activities here as well.